The 151 year battle has been long and arduous, and it’s most recent iteration played out across the terms of three U.S. presidents. 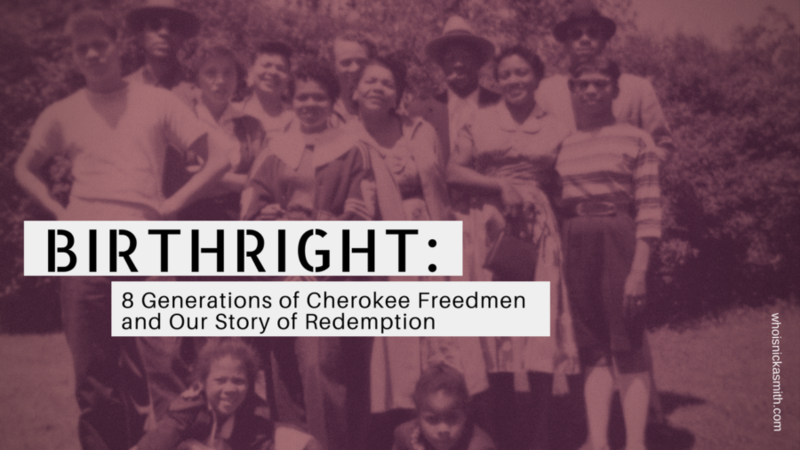 In order to truly understand the magnitude of the decision rendered by U.S. District Judge Thomas Hogan, we’ll take a dive into the history of Cherokee Freedmen through the lens of my own family. Snippet of the Eastern Cherokee Application of Charles Rab Rogers, grandson of Little Nan. Little Nan, her son Jesse, grandchildren, and extended family were enslaved by members of the Cherokee Nation. There were more than 1,000 people of African descent who were enslaved by the Cherokee as of 1828 and the number increased exponentially in the years that followed. Tales of “good slaveholders” abound in American genealogy and this is especially the case when it comes to the Five Civilized Tribes. Perhaps folks can’t fathom that one group marginalized for gain would in turn marginalize another group for gain, but that story has played out over and over throughout history worldwide. So little was thought of the Cherokee enslaved that they had no rights just like their brethren who were enslaved in the United States. Their narrative is largely removed or an afterthought when the Trail of Tears is discussed. 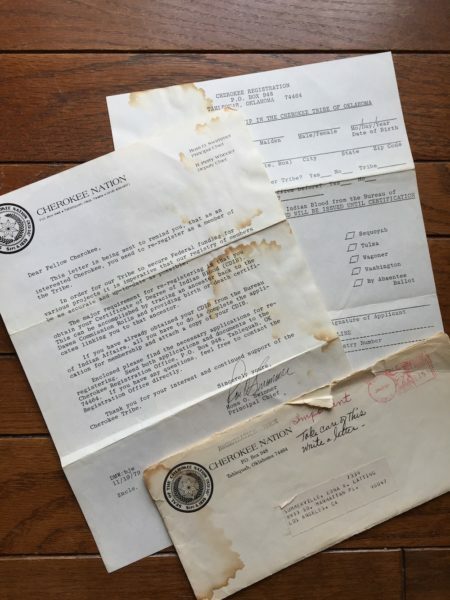 Little Nan’s slaveholder definitely transported her to the Cherokee Nation West, but whether or not it was voluntary or forced is still being researched. It was inevitable that tensions would mount with the foundation laid. In November 1842, a slave revolt took place in which the Cherokee blamed Seminoles of African descent for the uprising instead of their long history of discrimination against their Freedmen. 5 years later, Nick would have my 2x great grandfather, Isaac Rogers, with Martha May, a woman of Cherokee, European, and African ancestry who was enslaved by Cherokee Alzira Price May. 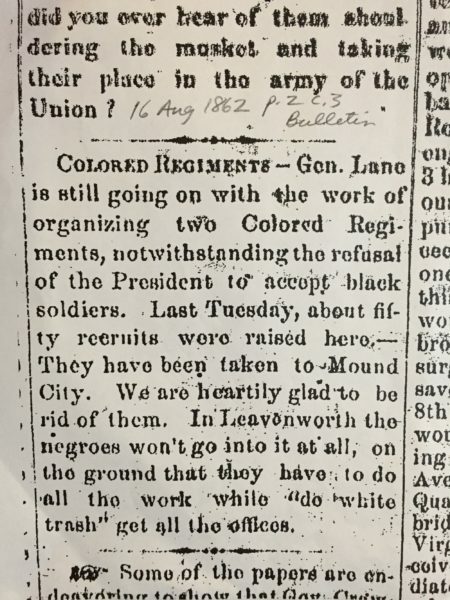 Fort Scott, KS Bulletin, August 16, 1862. As the Civil War began, the Cherokee Nation made their position known. They signed a Treaty of Friendship with the Confederacy in October 1861. The writing was on the wall. The Cherokee appeared to feel the cause of the Civil War was a question of losing their culture and nationality, which included chattel slavery. Sound familiar? 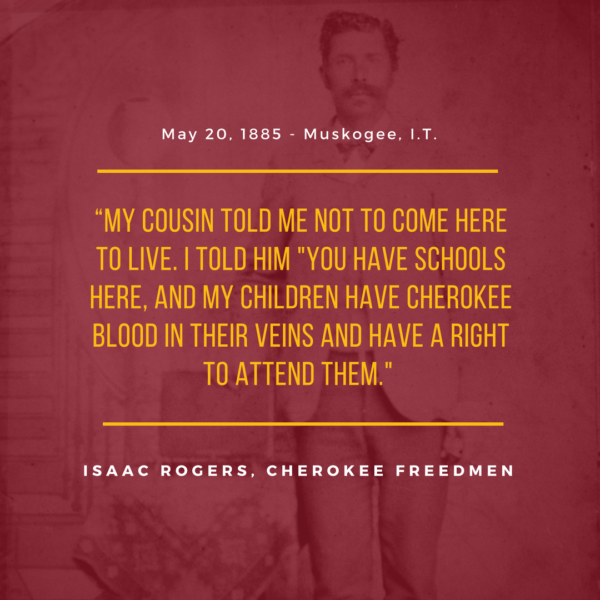 Isaac Rogers absconded from his Cherokee slaveholder and enlisted in the First Kansas Colored Infantry in Fort Scott on August 10, 1862. His unit, which eventually became the United States Colored Troops 79th Regiment, was one of the first that were enlisted and was the first to see battle in the Civil War. Less than two weeks after Isaac enlisted, Stand Watie, a staunch supporter of the Confederacy, became Principal Chief. Other family members, such as Isaac’s stepfather William Richardson and his uncle Charles Rab Rogers, enlisted in the Second Kansas Colored Infantry/USCT 83rd Infantry and the Second Indian Home Guards respectively. The 13th Amendment abolished slavery within the United States but did not emancipate slaves held by the 5 Civilized Tribes. Freedom for the Freedmen could only be achieved through a treaty with the U.S. government. 8 months would separate when the formerly enslaved in the U.S. were legally free and when the Cherokee Freedmen were legally free. Article 9 of the Cherokee Treaty of 1866 officially abolished slavery within the Nation and stated “all freedmen who have been liberated by voluntary act of their former owners or by law, as well as all free colored persons who were in the country at the commencement of the rebellion, and are now residents therein, or who may return within six months [February 11, 1867], and their descendants, shall have all the rights of native Cherokees”7 At the time, most of my family was in southeastern Kansas which later exempted them from being eligible to be listed on the final Dawes Rolls. Only one ancestor would remain and be my ticket into the Nation, my 2x great grandmother Sarah Vann Rogers. Page 124 of Cherokee Freedmen Jacob Bean, R302. Source: Fold 3. The Cherokee Freedmen were treated inconsistently. Some were allowed to vote in elections while others were not. 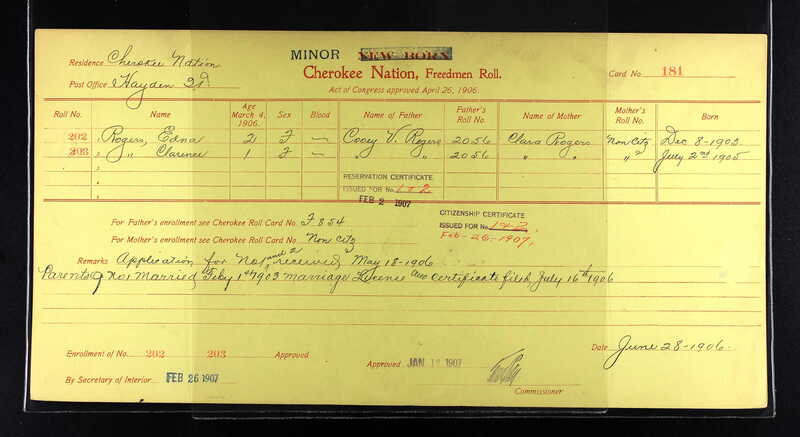 Some went before the Cherokee courts to obtain a stamp of approval of their citizenship prior to the Dawes Commission and were approved while multitudes were not. As payments for land sales were disbursed to members of the Nation who fulfilled the blood quantum requirements, those same payments were not dispersed to the Freedmen despite the language in the 1866 treaty. Congress intervened but yet the Freedmen had to sue again and actively pursue their citizenship rights. Eventually (after the Wallace Roll and Kern Clifton Roll) the Dawes Commission would come to pass ensuring the rights of but a portion of the Cherokee Freedmen. All the while vigilante justice was enacted, just like in the U.S, such as the time family members were accused of murdering the son-in-law of Clement Vann Rogers and were nearly lynched by the Cherokee. Rogers was the former slaveholder of their parents and father of humorist Will Rogers. Eventually, the dismissal of the charges would get nowhere near as much ink as their alleged deeds. Sound familiar? 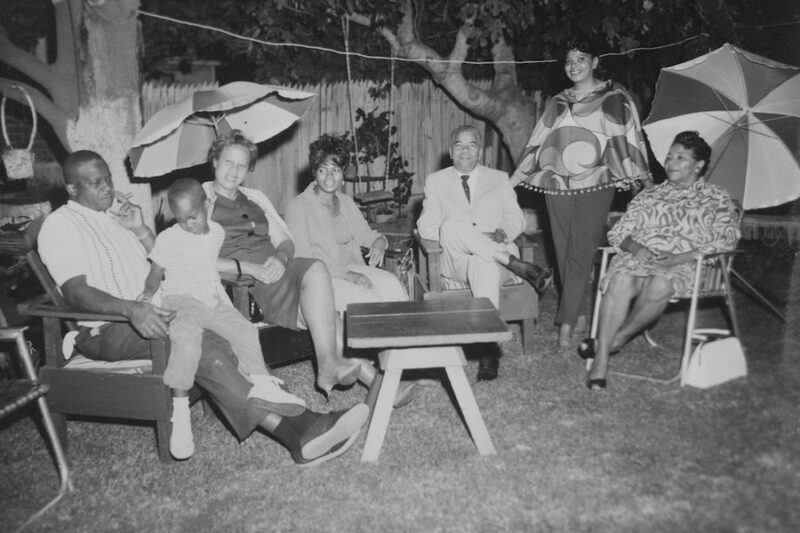 Jack Oscar Sewell, Vance Rico Morris, Rosa Lee Rogers, Gala Adrienne Sewell Morris, Wilbur Rogers, Lois Elaine Rogers Sewell, Edna Rogers Somerville. “In order for our Tribe to secure Federal funding for various projects it is imperative that our registry of members be as accurate and up-to-date as possible. The problem was Aunt Edna didn’t have to do that. She was an ORIGINAL enrollee. Letter and application sent to Edna R. Latting Somerville by the Cherokee Nation in January 1983. After 34 years, prompting from Marilyn Vann, and six attempts at sending in my own application last year, it’s finally taken care of. Finally. For the longest time I didn’t even want to pursue membership, but I came to the conclusion it’s my birthright. And I’m going to take it. All 8 generations. Period. (1) Rogers, Rob (21150), page 5. 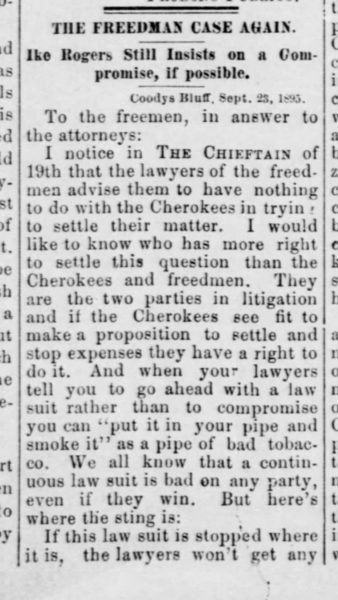 Eastern Cherokee Applications of the U.S. Court of Claims, 1906-1909. Accessed 31 Aug 2017 via Fold3.com. (2) “GENERAL COUNCIL OF THE CHEROKEE NATION. NATIONAL COMMITEE (sic) , Monday, Nov. 10.” Cherokee Phoenix Transcription. Western Carolina University, 19 Nov. 1828. Web. 28 Apr. 2017. <http://www.wcu.edu/library/DigitalCollections/CherokeePhoenix/Vol1/no38/pg1col4b-5bPg2col1-2b.htm>. (3) “CHEROKEE LAWS. [Continued] New Town, Oct. 28, 1829.” Cherokee Phoenix Transcription. Western Carolina University, 10 Apr. 1828. Web. 28 Apr. 2017. 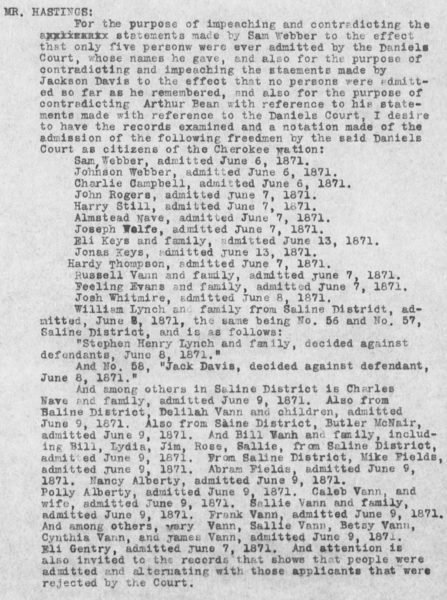 <http://www.wcu.edu/library/DigitalCollections/CherokeePhoenix/Vol1/no08/cherokee-laws-page-1-column-1b.html>. (4)”CONSTITUTION OF THE CHEROKEE NATION,.” Cherokee Phoenix Transcription. Western Carolina University, 21 Feb. 1828. Web. 28 Apr. 2017. <http://www.wcu.edu/library/DigitalCollections/CherokeePhoenix/Vol1/no01/pg1col2a-pg2col3a.htm>. (5) “CURIOUS INDIAN TRADITION.” Cherokee Phoenix Transcription. Western Carolina University, 29 July 1829. Web. 28 Apr. 2017. <http://www.wcu.edu/library/DigitalCollections/CherokeePhoenix/Vol2/no17/pg2col2a.htm>. (7) “Treaty with the Cherokee, 1866.” INDIAN AFFAIRS: LAWS AND TREATIES. Vol. 2, Treaties. Oklahoma State University Library, n.d. Web. 31 Aug. 2017. <http://digital.library.okstate.edu/kappler/vol2/treaties/che0942.htm#mn17>. (8) “The Freedmen Case Again.” Thursday, 26 Sep. 1895, The Weekly Chieftain (Vinita, Oklahoma), page 2. Accessed via Newspapers.com 28 Apr 2017.